It’s not just a product presentation that can be improved with some props. Thoughts and ideas can all benefit from a prop working as a useful analogy. If your presentation sets out to explain something or inform your audience then a prop will come in handy. You need to know how to use a prop when you are presenting. 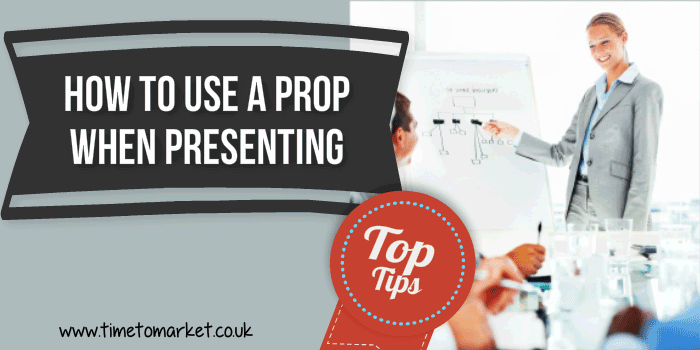 When you want to introduce something, explain something or summarise something in your PowerPoint or Keynote presentation this tip will show you how to use a prop when you are presenting. Reveal. Introduce your prop slowly but surely by uncovering or revealing it to your audience. A bulky object covered in a blanket will ignite interest among your audience. Make sure that your audience knows its name, its age, its source or provenance. Highlight. Take the opportunity to highlight a key feature or features of your prop. Keep your highlights short and to the point. Just take a look at these police presentation props for an example. Benefits. Summarise the benefits of the prop if it’s a product or device. If you are using a prop to explain an idea or a concept, then use the prop to conclude with the benefits of your idea. Practicality. If possible you should demonstrate the practicality of the prop. Or, you can show the practicality of your concept using your prop as an analogy. Because this really is an ideal chance to build movement into your presentation. Distribute. When you distribute a prop among your audience you build on one of the critical engagement steps. Your audience participates in your presentation. When you have an item or items circulating the room do make sure that you retain one yourself and keep the talk going. Five top tips to help you use a prop when you give a presentation. Highlight the key features and keep them brief. Summarise the benefits and stress the importance. Demonstrate the practicality of the prop. Distribute the prop within your audience. Working with props is an ideal way for you to get some key points across to your audience. Of course, you can use a prop to explain a product or service. Or, you can use a prop to provide a workable analogy to an idea or concept. Whatever your chosen prop, make sure that you rehearse, test and practise all your interplays. So, if the item opens, then test it. If it moves, then test that. Because you must become fully familiar with how it works…before you are ready to present. Therefore, props will give your presentations that extra dimension. So, it’s well worth the investment in practice. For more advice on how to use a prop when you are presenting, you can always attend a public presentation course. So, please don’t hesitate to get in touch when the time is right.